Nach Graffiti, Carnival und Mysterious kommt hier die zarte, helle Version von unserem beliebten Regenbogen-Verlauf auf einer Kette in ecru! Arc en ciel bestehend aus 100% hochwertiger Baumwolle, passt für alle und wird bestimmt ein toller Begleiter, das ganze Jahr hindurch. Coming soon. Hip 2B², 100% cotton. It’s time to stop pussyfooting around (a very wise woman told me any time you can properly use pussyfoot, you should) and get this party started. Hip2B² wasn’t really supposed to happen, but it’s here in all of its Minecraft glory. Woven on a four end tapestry warp (remember that pic of the awesome rainbow warp that was posted somewhere-yeah, that’s this wrap! ), Hip2B² is a wonderfully thick and cushy wrap. I’m not going to lie-it starts out beastly, but with some time and taming, it transforms into a puddle of supportive floof. 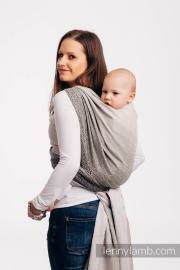 Hip2B² is perfect for toddlers and preschoolers and if you’re trying to prolong your babywearing days like I did-even for kindergartners who need some extra cuddles as they adjust to their new environment. 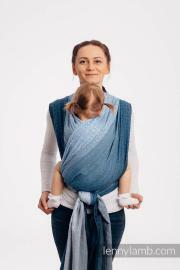 We've even sent this out as a tester to people with newborns, so if you like a thick wrap--this one's for you. 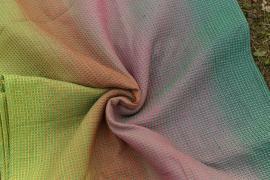 Preorder for beautiful rainbow Teia with multicolor weft who looks like hand dyed. 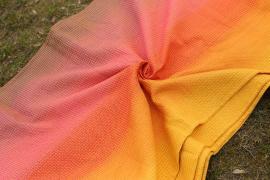 For all those who are waiting for Spring and Summer and would love to have very joyful and energetic wrap. And very limited in the same time, because we plan to weave about 10 pieces in each clolour. The wraps will be woven in April and delivered to customers withing the next 4 to 8 weeks. But we can not exclude the possibility that it will be even faster. 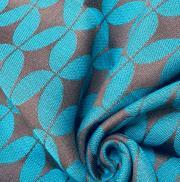 Teia collection will be about 280- 290 g/m2 and it is 100% cotton beauty. 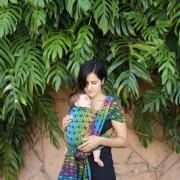 Preorder for beautiful rainbow with green weft and so loved by you Vafli pattern is open now. 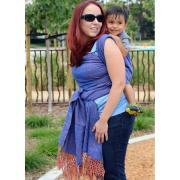 For all those who are waiting for Spring and Summer and would love to have very joyful and energetic wrap. In wonderful prices and extremely supportive. We recomend Vafli for all those who love 3D effect in a wrap. who love to wear even 4 yours old children. Those wraps are soft like a blanket and strong like a linen. 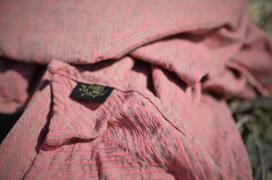 This is very limited collection, because we plan to weave about 10 pieces in each colour. 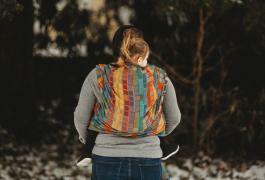 The wraps will be woven in April and delivered to customers withing the next 4 to 8 weeks. But we can not exclude the possibility that it will be even faster.The photos show the warp and weft. 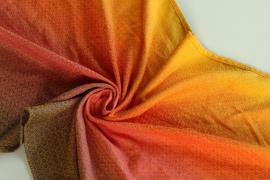 It should be remembered that the thread affects the shade of the wrap and changes the appearance of the warp. :) We also add a photo of the vaffle pattern in a different color from the previous collection, just to show how the tipe of weave looks like. On the picture with the model is vafli pattern , not heartwoven what is Teia. but you can see final colours Teia Black Perl there. 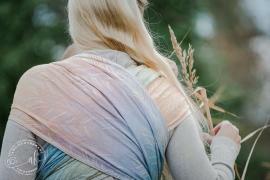 Preorder for beautiful rainbow with golden weft and so loved by you Vafli pattern is open now. 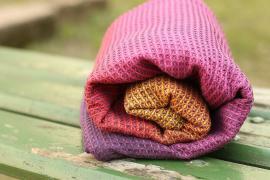 For all those who are waiting for Spring and Summer and would love to have very joyful and energetic wrap. In wonderful prices and extremely supportive. We recomend Vafli for all those who love 3D effect in a wrap. who love to wear even 4 yours old children. Those wraps are soft like a blanket and strong like a linen. 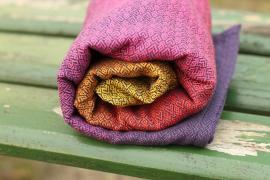 This is very limited collection, because we plan to weave about 10 pieces in each colour. The wraps will be woven in April and delivered to customers withing the next 4 to 8 weeks. But we can not exclude the possibility that it will be even faster.The photos show the warp and weft. 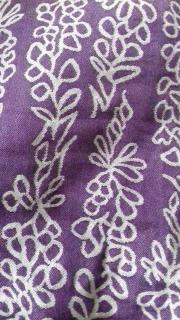 It should be remembered that the thread affects the shade of the wrap and changes the appearance of the warp. in this case wrap will be brighter :) We also add a photo of the vaffle pattern in a different color from the previous collection, just to show how the tipe of weave looks like.